Kaminski Auctions announces a two-day auction March 3rd and 4th, 2018. Day one will be an estate auction and Day Two will be a Designer Rug sale with all lots sold unreserved. The estate portion of the auction features the European fine art collection of Dr. Carl Katz, of Cincinnati, Ohio and Lake Garda, Italy. This auction is a great opportunity to purchase room size oriental and custom designer rugs from important Palm Beach estates. Kaminski Auctions announces a two-day auction March 3rd and 4th, 2018. Day one will be an estate auction and Day Two will be a Designer Rug sale with all lots sold unreserved. The estate portion of the auction features the European fine art collection of Dr. Carl Katz, of Cincinnati, Ohio and Lake Garda, Italy. Dr. Katz's collection includes a Francisco Miralles y Galup (Spanish, 1848-1901), French scene titled "Before the Church of the Madeleine." After studying under Ramon Marti y Alsina in Barcelona, Miralles made his career in Paris painting French scenes, of fashionable women in different Parisian landscapes. The painting on offer at Kaminski is signed and offered with an estimate of $20,000-$30,000. A second Spanish painter represented in the auction is Emilio Sanchez Perrier (Spanish, 1855-1907), well known for his landscapes the painting titled "Les Peupliers" is an oil on wood panel landscape of poplar trees on the river's edge and is valued at 18,000-$12,000. 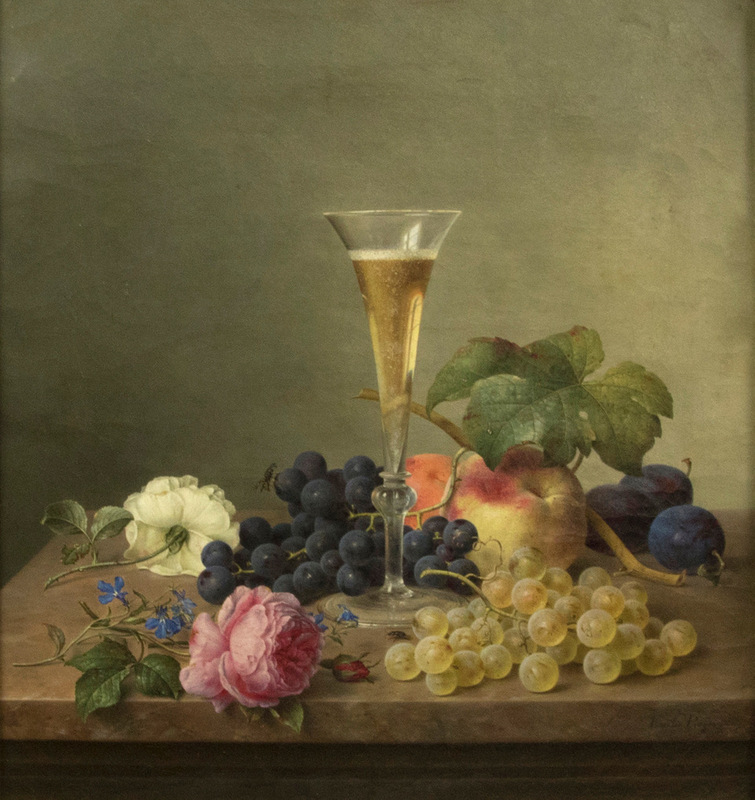 The cover lot of the Kaminski Auctions brochure features an excellent still life of fruit with a champagne glass, oil on canvas, by the German artist, Emilie Preyer, daughter of Wilhelm Preyer. This painting was at one time on loan to the Louvre Museum, Paris, by the artist and estimated at $20,000-$30,000. The French artist Raoul Dufy (French, 1877-1953), is represented in the collection with a watercolor/gouache, titled "Chapman at the Bois de Boulogne" and is expected to bring $7,500-$12,500. Other paintings on offer are a Harold Waldrum (American, 1934-2003), abstract, dated 1977, a sporting art painting of two pointing dogs in the field by the American artist Gustav Muss-Arnolt (1858-1927), a still life by the Russian artist, Osip Emmanuelovich Braz (Russian, 1873-1936), and a winter landscape by the Dutch artist Charles H. Leickert (Dutch, 1816-1907). Jewelry highlights include a ladies, 4.28 carats demantoid pendant set in a fourteen-carat yellow gold setting with a GIA report included valued at $12,000-$18,000. From the Katz estate, there are a ladies fourteen-carat rose gold diamond engagement ring with a .625 ct, center diamond by Pageo of Boston and Nantucket, a pair of ladies eighteen-carat yellow gold Etruscan-style earrings made by Ilias Lalaounis, and an eighteen-carat yellow gold handmade link chain necklace with tassels. Furniture highlights include an antique Italian Florentine paint-decorated and silver leaf hand-carved three-drawer chest by Panziani, an 18th-century burl walnut William and Mary highboy, and a rare 18thcentury Peruvian polychrome and wood "escritorio" purchased at the Peyton/Wright Gallery, Santa Fe, New Mexico. A Henry Bertoia bronze "sonambient" sculpture, a 19th-century Indonesian/Borneo (Sarawak, Rajang River) papoose with intricate beadwork, and a gold proof set ofUnited States Mint "American Eagles" consisting of four coins in their original case are among the other diverse lots in the sale. 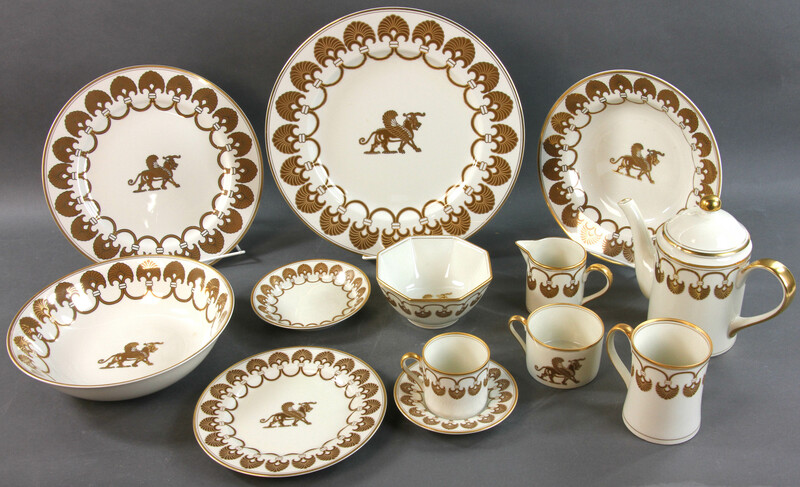 Porcelain collectors will find over 200 partial china sets, dinner services and glassware including such well-known names as Royal Crown Derby, Limoges, Worcester, Royal Dalton, Fitz and Floyd and Rosenthal among the lots on offer. 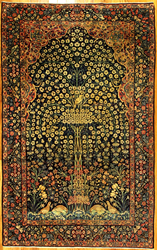 Day two of the auction will feature a high-end designer rug sale with all lots sold unreserved. The rugs are all from Palm Beach, Florida estates and the collection is an opportunity to purchase oversize quality rugs at a fraction of their original value. There are mansion or palace size antique Oushak rugs, an exceptional Nepali wool rug with silk flowers that was a special order designer rug that originally cost $8000, and a thirty-four-foot designer braided leather runner that was purchased for $11,000, as well as several semi-antique floral hooked rugs labeled Stark. Exceptional antique rugs include Persian Kermans, Indo Sultanabads, French Aubusson style needlepoints, Persian Tabriz, Mahals, Sarouks, Indo-Isfahans, Kazaks and many more. There are over 300 exceptional rugs on offer. Preview days for this auction are Monday–Friday, February 26-March 2, 2018, 10:00 AM- 5:00 PM and day of sale beginning at 8:00 AM at the Kaminski Auctions gallery, 117 Elliott Street, Rt. 62, Beverly, Massachusetts. Preview is open while auction is live. For more information go to http://www.kaminskiauctions.com and sign up to bid with KaminskiLIVE.